What is Artificial Intelligence (AI) ? 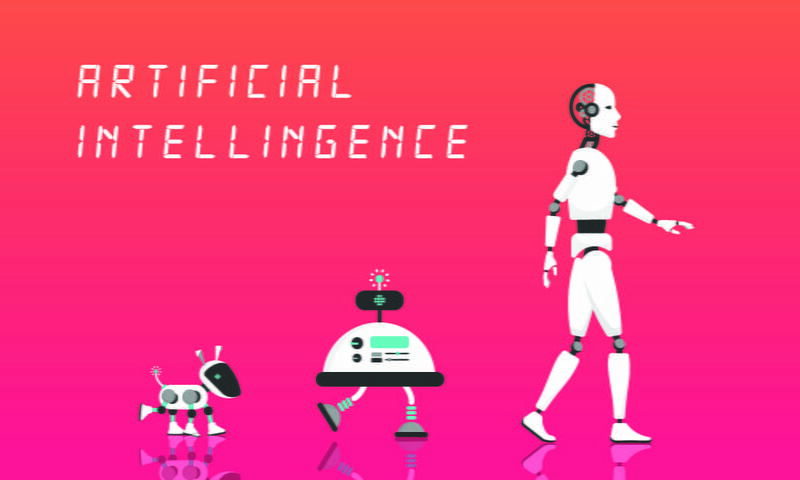 Artificial intelligence is a technology that deals with complex problems of machines, such as people, to produce solutions and to mimic the way people think. It is usually performed by simulating the functioning of nerve cells in the human brain, simulating human intelligence and applying algorithms produced by computers. How Does Artificial Intelligence (AI) Work ? Artificial intelligence is formed after long studies maintained by high-tech devices and expert computer scientists. First, it is determined which area of artificial intelligence to use. The artificial intelligence algorithms developed in this area can then be tailored to the needs. The principle of artificial intelligence is essentially the same, even if different algorithms are developed for each artificial intelligence. By entering a large amount of data into the computer, artificial intelligence begins to automatically learn from the patterns or properties of the data with the previously created algorithms. Machine learning: Automates the process of creating an algorithm. The data is not planned to be examined, where it should be looked at or what to conclude. It uses neural networks, statistics, operations research, and physical methods to make sense of this data by reaching confidential information in the data. Artificial neural Network: A machine-learning type consisting of interconnected units (such as neurons) transmitting information between each unit. It requires multiple transitions to the data, such as a neuro-functioning mechanism to find links and make sense of undefined data. Deep Learning: Uses advanced training techniques to learn about large neural networks and complex models of large amounts of data, utilizing a number of processing units that benefit from advances in computing power. AI Use Areas in Our Daily Lives? Smart cars: The driverless car models developed by many brands, including Tesla, Google’s head, have advanced artificial intelligence. These vehicles, which take into consideration the road status and traffic status, can completely eliminate the problem of driving people in the following years, even if they are not yet developed at the desired level. Virtual Assistants: Personal virtual assistants, such as Siri that Apple uses, now and the Cortana used by Microsoft, are the main artificial intelligence virtual assistants that we use almost all of us now. Games: The new versions of games like Far Cry and Call of Duty, developed for computers and consoles, have very superior artificial intelligence. These game bots can decide their moves by considering many criteria and become a powerful opponent in front of users. Purchasing estimates: With artificial intelligence that many companies like Google AdSense and Amazon use, they can make accurate sales recommendations considering the calls that computer users have previously made. This system is also used in Internet advertisements. Fraud prevention: The vast majority of advanced antivirus software and large search engines, such as Google, can be fooled by users and filtering pages with misleading content, and can be removed. Chat and Support bots: these bots, developed to respond to users ‘ needs for 7 days and 24 hours, can chat with you in writing and provide information from the desired area. Although the desired yield in this type of bots is not able to be substantially higher, Facebook’s leaps of interest in this regard can be surprised by the functioning of artificial intelligence. Security systems: Security systems that have the authority to allow entry only with identified identity, voice or face are also one of the most impressive areas of artificial intelligence. When people get bored while making these kinds of protocols, the machines are not immediately bored and provide security without compromising. Also, the machines cannot be intercepted by social engineering attacks. Music and cruise suggestion robots: Popular music services like Spotify can sometimes benefit from artificial intelligence. For example, Spotify can offer you new songs that you might like, considering the artists and songs you listen to. ⟵What is augmented reality (AR)?